The Lacy is medium in size with a light, balanced yet powerful build. Correct Lacy movement alludes to great speed, strength and dexterity. Their coat is short and sleek. There are three permissible color varieties. Blues are any shade of gray from light silver to dark charcoal. Reds range from light cream to rust. The tri combines these colors with a blue base and distinct red markings as appropriate for trim. White can appear on the chest, stomach and paws. Both the red and tri-colored Lacy's hold the name Blue Lacy due to the blue-color gene they possess. 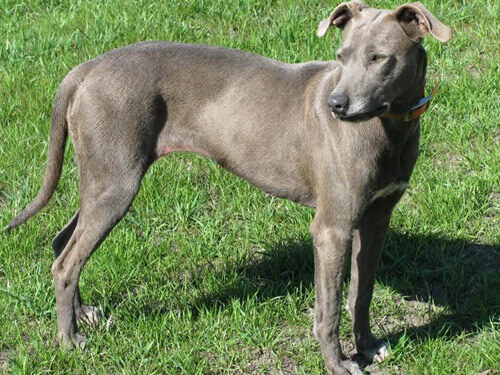 All Blue Lacy's eyes are very bright and distinctive orange to yellow in color. Which adds a unique touch to their appearance. They adapt well to most living conditions. Lacys make good house dogs but love being outdoor dogs as well. They may become bored and destructive when left alone with nothing to do, so crate training is recommended for indoor dogs. Lacys do need room to run and may not be the best fit for apartment life. Like most working breeds, the Lacy needs lots of leadership and exercise. They were created to be a working dog and breeders prefer to place dogs in ranching and hunting home to preserve that heritage. When not working, Lacys should be taken on a long, brisk daily walk. But walks alone are not enough for Lacys. Many need a challenging job such as herding, hunting, tracking, agility or flyball to be balanced dogs. Lacys were developed in the Texas Hill Country by the four Lacy brothers (Frank, George, Ewin, and Harry), who immigrated from Kentucky to Burnet County, Texas, in 1858. Traditional wisdom, as well as Lacy family history, holds that Lacys are the result of Greyhound/scent hound/coyote cross. Multiple sources also suggested that the presence of Lacys in the Hill Country strongly influenced Fred Gipson, who was raised in adjacent Mason County and was best known for his novel Old Yeller. The Blue Lacy Game Dog filled the needs of colonial Americans for well over a century on ranches in the Southwestern US. The decline of the family-owned ranching industry, as well as the introduction of technology such as all-terrain vehicles, brought the Lacy breed near extinction; however, its rediscovery as a masterful hunting companion has dramatically increased the demand for Lacys. They are now the most common breed used by United States Trappers.